Do oscillating multi-function tools make the cut? We tried 4 to find out. These tools aren’t designed for big cutting jobs. They won’t replace a circular, jig, or reciprocating saw. But for those smallish cuts in difficult places nothing else works as well. And not just on wood – with an appropriate blade you can cut metals, plastics, heavy fabric (including carpet) and ceramics. You can also scrape away sealant and dried glue, sand and scour. These tools are truly multi-function. We recruited a serious renovator to trial 4 popular multi-function power tools. We did not test them in a lab. 3 were mains powered and 1 was battery powered. 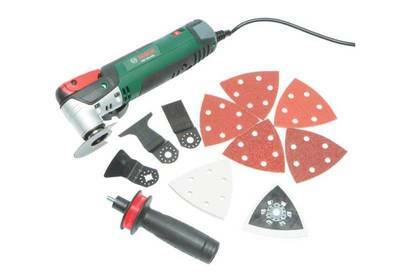 We were looking for an easy-to-use and lightweight tool with minimal vibration and a good range of supplied accessories. An extensive range of optional accessories was also desirable. Has a very good detailed manual that’s easy to follow, plus a simple “quick start” guide. Its unique lock-in mechanism makes blade-changing a breeze – no hex key or other tools are required. There’s no kickback on start-up, and vibration is minimal on high speed. Noise level is tolerable. Bottom line: Performs very well and is very easy to use. We think it’s the best option for serious DIY. Good clear instructions. Changing blades is easily done with the supplied hex key – though it isn’t as convenient as the Bosch keyless system. There’s some vibration and noise on the lowest speed setting, and plenty on the fastest speed. It’s not too heavy and its side handle provides extra support and control. We rate this product as good overall. 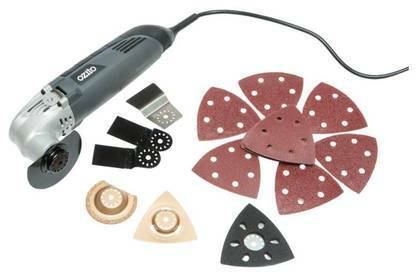 It’s good value for money given the number of accessories supplied and its relative low cost. However, the noise and vibration is a problem – so it may not suit someone who uses it frequently. Bottom line: Performs well and is easy to use. A good choice for occasional use. Instructions are minimal. Changing blades is easily done with the supplied hex key – though it isn’t as convenient as the Bosch keyless system. There’s no vibration or kickback on start-up at low speed, but it’s very noisy on the higher speeds. It’s also heavier than the others, and doesn’t come with a side handle. Although it performs well overall, we found it too heavy for continued use. Bottom line: Performs very well and is easy to use – but it’s heavier than the others. Perhaps better suited to trade use. Instructions are minimal. Changing blades is easily done with the supplied hex key – though it isn’t as convenient as the Bosch keyless system. It has little vibration, is easy to hold and not too noisy. But there’s only one speed, and it cuts and sands more slowly than the mains-powered models. The total cost with tool, battery and charger makes this an expensive unit. Battery/charger pack must be purchased separately. Bottom line: Performance isn’t as good as the mains-powered models – but battery power means it’s portable. 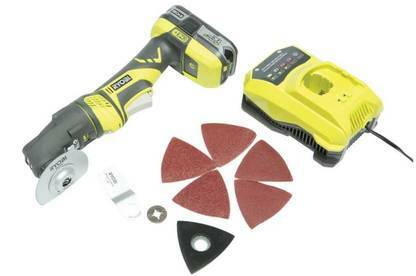 Cost of the tool plus battery and charger makes it expensive – although the battery and charger can be used with other Ryobi cordless tools. Good-quality blades cut better and last longer, especially when you’re cutting metals. But they can be very expensive at local hardware chains. 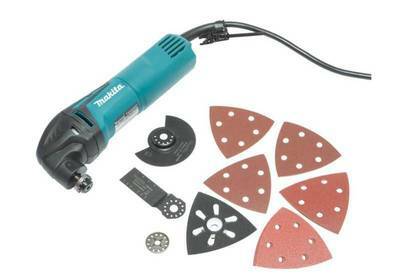 Try trademe.co.nz, multifitblades.com, ebay.com or google “oscillating tool blades”. Just make sure the blades you order fit your model … and watch out for freight charges.